If you have a mulberry tree count yourself lucky! 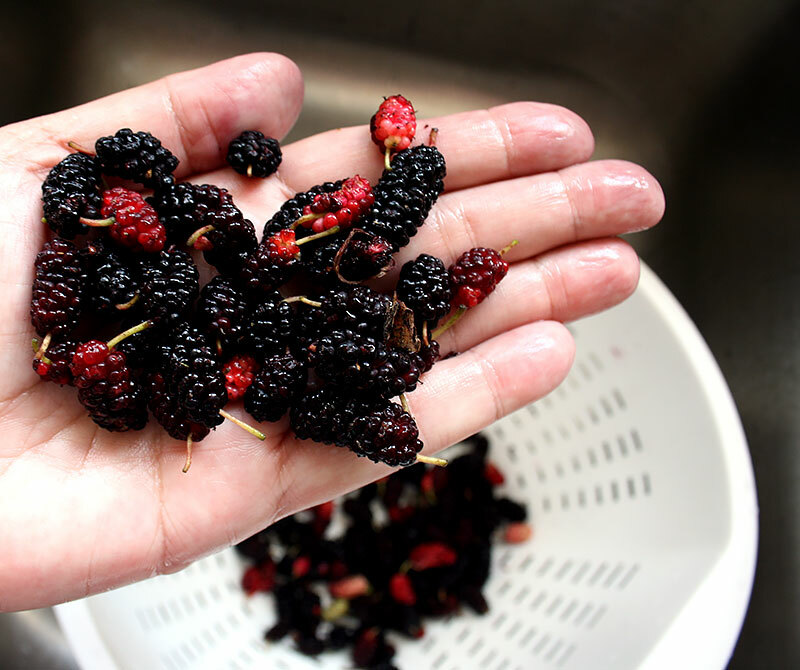 We love to forage and harvest wild foods and making mulberry jelly has fast become one of my favorite recipes. We have access to several trees but with their short season and being a favorite of birds we have to move fast to harvest them. Boone harvested about a gallon or so for me the other morning as soon as the majority of the berries were ripe. He takes a tarp, lays it under the tree and shakes the branches so the berries will drop to the tarp. 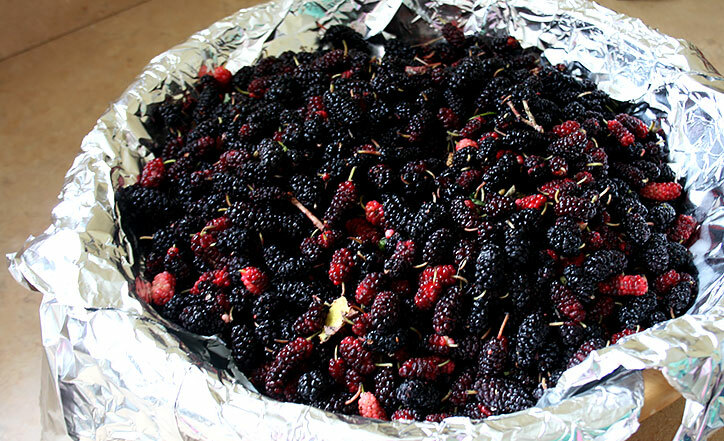 Mulberries, though they resemble blackberries, are small and delicate. Picking them is tedious and time consuming. He put this batch in a foil lined bowl and into the frig until I could get to them. The next morning I started the process of cleaning them. When shaking them from the tree, small twigs, leaves, etc. will drop with them. To be sure they are cleaned thoroughly I gather a small handful and rinse them under running water, rolling them from hand to hand and then dropping in a clean pot. I put a mesh strainer in the sink drain to keep any large particles from going down the drain. Once I have them all cleaned I pour the berries in to a colander to drain. Since I am making jelly I do not destem the berries unless the stem is really large. It would take forever to destem all of them and the stem does not cause any harm in the jelly preparations since you are squeezing the juice out. If it was a jam or preserves recipe then I would destem them. I use the mulberry jelly recipe from the National Center for Home Food Preservation Mulberry Jelly. It is simple and turns out great. If you have never made jelly before it is not hard to do. There are quite a few sites online that have step-by-step instructions or you can pick up a Ball canning book. My tips are: gather all of your supplies together first, pour all of the sugar required into a bowl so you can pour it all at once in the fruit and wear an apron to keep splatters off your clothes.